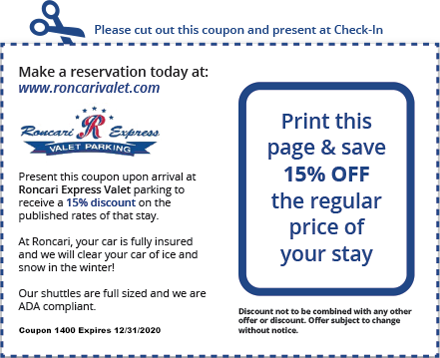 Roncari Valet Parking is the CLOSEST valet parking service to Hartford/Springfield Bradley International Airport. Touch N Go AppRoncari’s Mobile App makes your return even faster. Both Android and iPhone applications available. Another Roncari StarCard member Advantage that is easy to download and even easier to use. Get Touch N Go here. StarCard Frequent Parker ProgramThis free program speeds your check-in, earns points when you park at Roncari, can be redeemed for free parking or car care services, and tracks all your activity. Must be a StarCard Member to get Touch N Go app. Sign up for your FREE StarCard here. Safety is our MantraWe offer the safest and most secure parking experience. Our specially trained drivers, completely paved lots, security guards and cameras, plus lighted fenced-in lots, ensure your car is cared for like it was our own. Read more about our safety and security procedures here. Special DiscountsMake sure you check here for special discount opportunities. 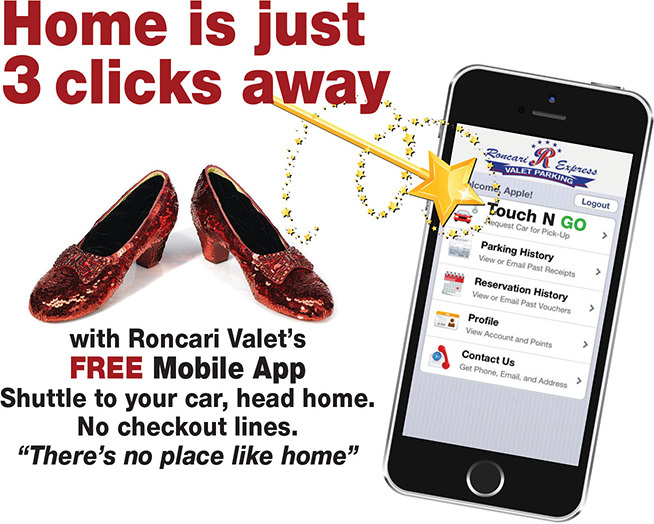 GETTING HOME IS EVEN EASIER WITH RONCARI VALET NOW AT YOUR FINGERTIPS! Come back to a sparkling clean car. It is important to “winterize your car” before you leave it parked for any length of time. Read our article on 4 Tips on Winter Car Care. Better to be prepared so your car is ready to go when you are. Additional 6.35% CT State sales tax, 10.6% airport access fee, and fuel surcharge applies to all rates. Gas surcharge and rates are subject to change at anytime. Save 26% off regular posted rates when you show your card at Roncari. We are locally owned. That is an important difference between us and the other parking concerns at Bradley. Roncari Valet has been owned and operated by the Roncari Family since 1995. Our name is on the door. Parking & Caring for your car like it was our car. The safest and most secure parking experience.